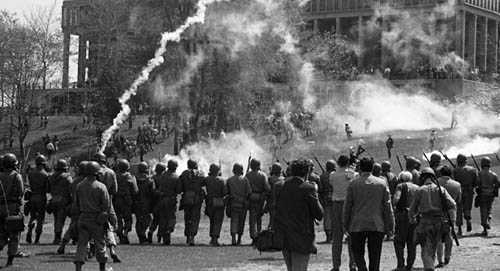 In the events leading up to the horrific May 4 shooting at Kent State University, no one knew, or could have known, what would come. This was the most politically tumultuous time the campus had ever known. Students were actively protesting for what they believed was right and never expected to be shot or shot at for it. The signs couldn't have been there, because it had never happened before. Now, the university and others work to insure that it will never happen again. 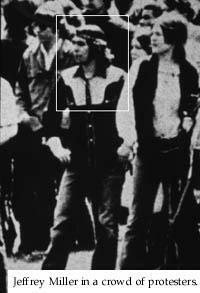 Before 1970, the Kent State Chapter of the Students for a Democratic Society was actively involved in the anti-war movement to stop the increasing bloodshed in Vietnam. This was in reaction to the news that 58,000 Americans and millions of Asians had been killed in Cambodia, Laos, and Vietnam. Within the classrooms, activism was sometimes discussed, but that really didn't promote activism among the students. Instead, other things, such as the daily news reports and discussions amongst students and their Vietnam veteran friends, provoked the students to join in the antiwar protests. Cambodia: United States and Vietnamese forces mount a ground attack. In response to the announced attacks on Cambodia, student protests grow. The ROTC building receives the brunt of their outrage. It is attacked, and small fires are started around the building. Mayor of Kent, Leroy Satrom, requests that the National Guard be sent to the town and university to maintain order. 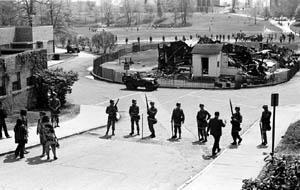 On Sunday, about 1,000 National Guardsmen are sent to occupy the campus, with few soldiers left in the town itself. At around 10:00pm the ROTC building is found fully ablaze. "[They are t]he worst type of people we harbor in America...Worse than the communists...We're going to eradicate the problem!" May 4 was another day of activism. Students were notified that the rallies were prohibited while the National Guard occupied campus. The students proceeded to protest, disregarding the order. 12:00pm - About 2,000 people gather at Kent Commons in protest of the guard occupation. A dispersal is ordered, but upon hearing this, the taunting grows worse. Students throw rocks. In response the Guardsmen launch tear gas at the students. After being chased to the football field, the students and Guardsmen experienced a short standoff. Rocks were again thrown. The guardsmen knelt down and took aim, but there was no shooting. The troops regroup and begin marching in retreat. Once on Blanket Hill, much to the shock of the protestors, Troop G turns and fires on the students. In 13 seconds, a total of 67 bullets were fired. When the smoke cleared, nine people were wounded, and four lay dead.